"Junkanooaacome” is a site-specific, interdisciplinary/interactive project consisting of workshops, performances, and other media intended to decolonize and raise awareness of NYC’s historic spaces and monuments still bearing names of slave masters. Junkanoo is a centuries old ritual and art form based on celebrating freedom. It is a pre-abolition satirical masquerade and decolonization satirical ceremony confronting slave-masters, and practiced during Christmas in parts of the Caribbean. Celebrations include parading with ornate costumes including grand hats replicating houseboat mansions, while others entail colorful characters engaging in miming, drumming, and dancing. It’s namesake is born from the respect of the 18th century Akan warrior, Jon Konny who defended his native Prince’s Town, or what is known in the present day as Ghana, from the Dutch colonizers for more than 20 years. Junkanoo is a performance of freedom! Jamaican born artist Lyn-Kee-Chow explores the different characters of the Jamaican Junkanoo through a series of performances and workshops. Participants are invited to help revive this tradition. Public workshops will feature a historical overview of each character along with costume building using ready-made materials. Shredded cloth and “junk” will be used to create Junkanoo costumes and props that are meant to be activated during performances while addressing the remnants of slavery displayed throughout NYC’s historical landmarks. The carnival processions held on Labor Day in Brooklyn celebrate Caribbean traditions once a year. Though there is a large Afro-Jamaican population in Brooklyn, the Labor Day parades do not typically include the specific characters featured in the traditional Jamaican style junkanoo, which are more confrontational, and not only a theatrical presentation. 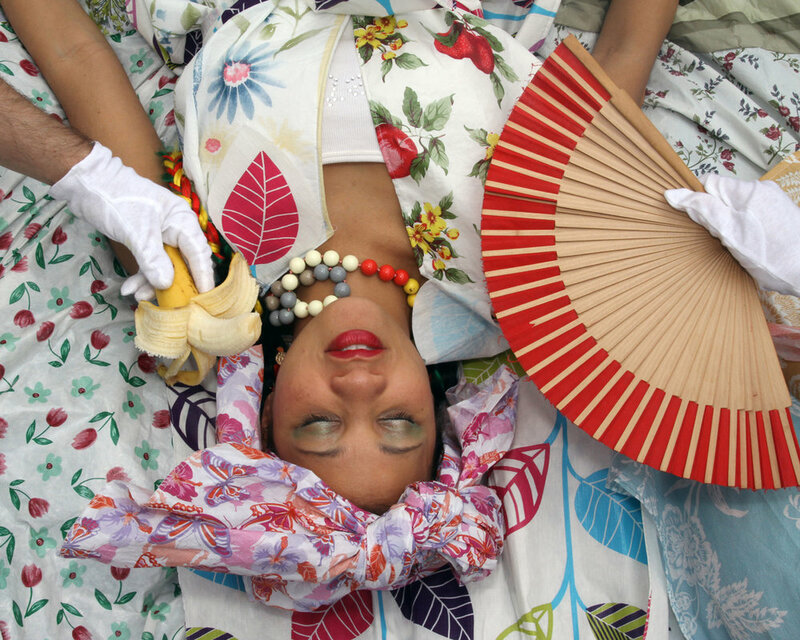 Lyn-Kee-Chow aims to celebrate decolonization by making this Jamaican Junkanoo relevant during other times of the year through a series of street performances and interventions. She is researching the customs of the past and re-inventing ways to address today’s political climate. Lyn-Kee-Chow plans to eventually form a complete Junkanoo troupe of over ten characters. As participants help make a new costume for the troupe the artist hopes to integrate their own histories of the past as they incorporate their labor and their materials into the costumes. Each participant and their repurposed items bear their own histories, and these will become united with others’ to create new futures. Jodie Lyn-Kee-Chow (b. Manchester, Jamaica) holds a BFA with honors in Painting from New World School of the Arts, University of Florida, (1996) and an MFA in Combined Media from Hunter College, CUNY (2006). Lyn-Kee- Chow often explores performance and installation art drawing from the nostalgia of her homeland, the commodified imagery of Caribbean primitivism, folklore, fantasy, consumerism, spirituality and nature’s ephemerality. New York, N.Y., Amelie A. Wallace Gallery at S.U.N.Y. Old Westbury, N.Y., MoCADA (Museum of Contemporary African Diasporan Arts), Brooklyn, N.Y., Grace Exhibition Space, Brooklyn, N.Y., Lehmann Maupin, New York, N.Y., and Art Museum of the Americas, Washington, D.C.
Lyn-Kee- Chow’s work has garnered the following; NYFA (New York Foundation for the Arts) Fellowship Award in Interdisciplinary Art (2012), Rema Hort Mann ACE (Artist in Community Engagement) Award (2017), Franklin Furnace Fund (2017-18). Her work has been reviewed in publications such as The New York Times, The Huffington Post, The Washington Diplomat, Daily Serving, Hyperallergic, Artinfo, The New York Art World, Super Selected, and Newsday. Lyn-Kee- Chow lectures for School of Visual Arts M.F.A. program and Fine Arts Residency in Contemporary Practices. She also lives and works in Queens, N.Y.